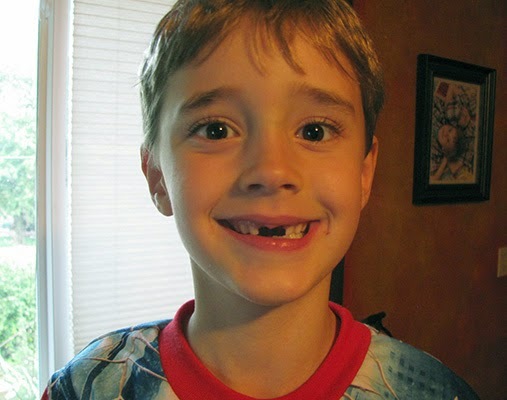 Last week Isaak came out of his bed with a huge smile on his face and said, "Mom I lost another tooth!" Now this is the 3rd tooth he's lost all in the same area. Daddy cleaned up his bloody hands. He said, "Dude I don't think this one was all the way ready to come out. I wiggled it earlier, and it wasn't loose enough." We think Isaak yanked, twisted and pulled all to get some quarters. He looks like he was punched in the face. It makes me crack up.